At least one person has been killed after a rocket landed near a school in south-eastern Turkey, close to the Syrian border. The rocket was reportedly fired from Syria and hit a school garden in the border province of Kilis, with at least one other person wounded, a government statement said. Two other rockets landed in an empty area nearby, it said. Cross-border incidents have been frequent during the Syrian conflict. The person killed has been identified as a female school cleaner, a statement from the provincial governor's office said. A wounded female student was taken to hospital for surgery, it said. Turkish military sources told Reuters news agency that Turkey's army had retaliated "in kind" to the attack, targeting the so-called Islamic State (IS) group in Syria. The agency quoted unnamed sources as saying that Turkish military radar showed that IS outposts in Syria had fired on Kilis. Earlier, the mayor of Kilis, Hasan Kara, had identified the fire as mortar shells. 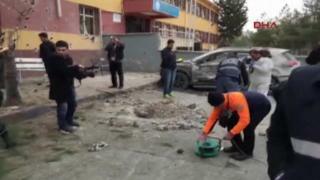 But Turkish media reports described the objects as Katyusha-type rockets, AFP news agency reported. Television footage showed children and women crying and screaming being escorted from the school. The windows on the ground floor of the building were smashed by the impact of the blast and one car was severely damaged. Turkish towns next to the border have frequently seen artillery fire spill over during Syria's civil war. In September, one Turkish soldier was killed in Kilis by cross-border fire from Syria. Turkey is part of the US-led coalition against IS and has also been a target of the group. A suicide bombing last week in Istanbul, blamed on IS, killed 10 people. The group has also been blamed for other bombings in Turkey, including an attack in Ankara that killed more than 100 people last October.